The Runner is very much a neighborhood restaurant, and one that’s needed in this particular neighborhood. (I’m selfishly interested because it’s likely that I will move back to Myrtle Avenue in the fall.) It’s the kind of restaurant–mousses, bone marrow, oysters, brown spirits–that wouldn’t be groundbreaking in other parts of Brooklyn, but Myrtle Avenue has held out a little longer than other gentrifying drags Even in Clinton Hill, Fulton Street gets most of the newcomers. I’m often torn between wanting to try a brand new restaurant and giving them some breathing room because, you know, kinks can cloud an experience. Then again, if a restaurant is obviously on a PR tear, they’re asking for customers. And on my first visit (I will come back) The Runner didn’t seem prepared for them. It also seemed like I’d fallen into some vortex, arriving with reservations before the crush, yet getting lost in the subsequent shuffle. A table came in after I did, ordered steak frites, ate their steak frites and paid for their steak frites before my steak frites showed up. And the steak frites were my favorite thing (hence, the half-eaten iPhone pic because I dove in so quickly). 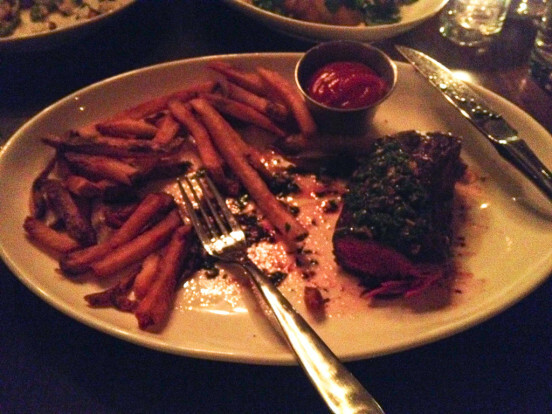 The fries were perfect, neither too fat nor thin, and the hanger steak was spot-on medium-rare with pan juices blending with what seemed to be a scallion-based chimichurri. It’s a good deal for $18. The pizza oven leftover from the previous tenant (Anima, which I walked past a zillion times but was never compelled to visit) is being put to all sorts of uses like the tongue bread that contains no offal (sadly). 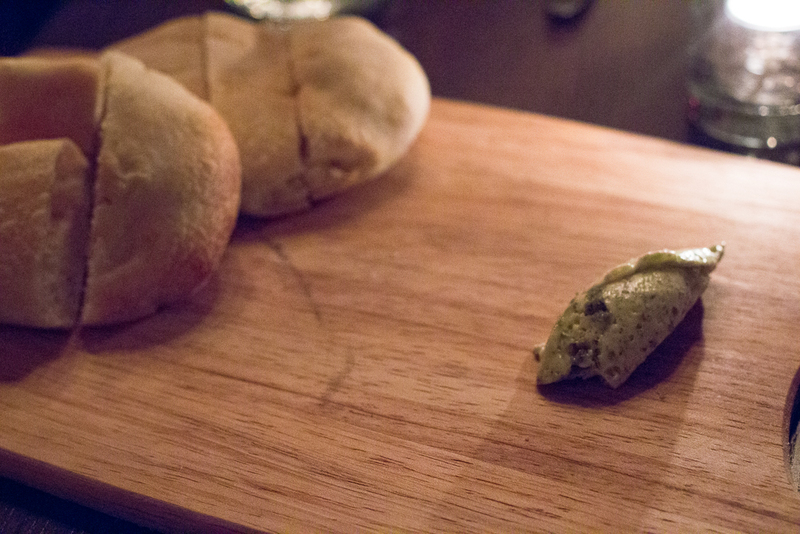 It’s cibatta vaguely shaped like a tongue, and really a warm, crusty vehicle for the amazing pistachio-honey butter. Even used sparingly, though, there wasn’t enough butter for the amount of bread. 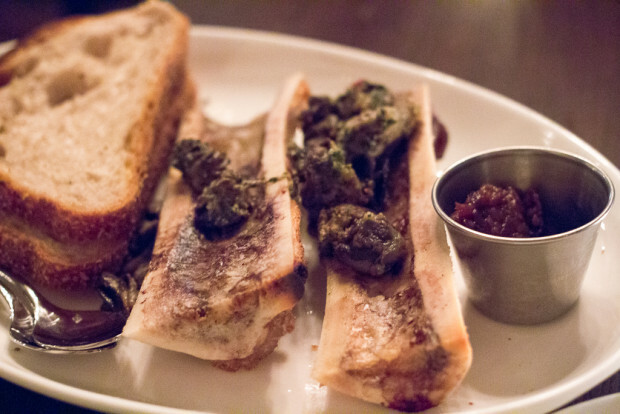 Ah, bone marrow a la M. Wells, topped with breaded escargot like a new classic. The snails and sweet onion-apple jam would be great with bone marrow, but the vessels didn’t contain enough wobbly fat to even spread on a piece of toast (in contrast to a version I’d encountered a few nights before at Extra Fancy where there was almost too much marrow for the bread). There are two vegetable dishes. 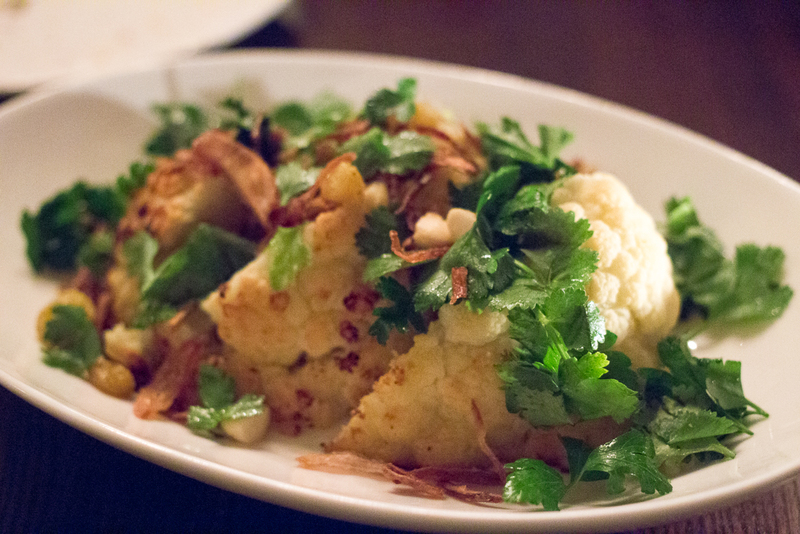 I received both; the roast cauliflower with raisins, fried shallots and parsley that I originally wanted, and agrodolce spaghetti squash with pine nuts and basil as a free buffer while waiting for entrees. They did make a good lunch the next day. Efforts were made to smooth the logjams (initially, I attributed the issues to the oven but a cocktail also took nearly 30 minutes to arrive). I was also offered a free dessert, but declined because I’d already had more than enough food. Despite some glitches, I could see myself returning and having the steak frites (also that tarte flambé) and a glass or two of wine at the bar. 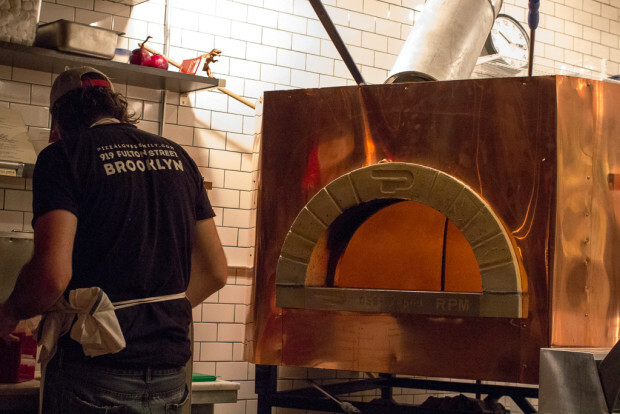 Something about Clinton Hill attracts upstart pizza makers who modernize anachronistic ingredients, and I’m all for it. The Provel cheese used at Speedy Romeo taps into some part of my soul, despite having zero roots in St. Louis. Processed cheese is one thing. Bell peppers are quite another. The ground pork sausage and still crunchy green peppers (mushrooms are ok) on The Camp Randall at Emily dredges up the unsavory past. At least there were no canned black olives and the cheese curds were unexpected. Even though the combo made me want to cry, I do appreciate the presence of a midwestern “supreme” pizza among the taleggio, prosciutto and honey. I kept quiet, though, because I’d picked the pasta and didn’t want to be a ordering control freak while dining with a semi-ex-boyfriend. 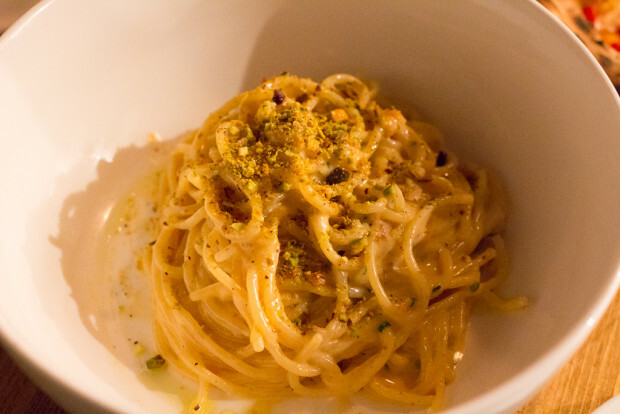 The spaghetti was al dente and crazy rich as you’d expect from ‘nduja, uni and pistachios. It was the crushed nuts, oddly, that stood out the most. The sea urchin and spreadable spicy sausage lost their distinctiveness and instead lent an overall creaminess. It looks to be a work in progress; the current iteration keeps the ‘nduja and adds curry leaves and a poached egg instead. The kale hegemony is finally complete. I was warned about a change in the kale salad even though I wasn’t ordering the kale salad. It’s now just assumed that all diners will order the kale salad (our neighbors did). No, break free and get the hearty greens in a mustardy vinaigrette with crispy ribbons of fried pig ears that act as a bacony crouton. Interestingly, 1 Knickerbocker has a similar salad that contains curry leaves. 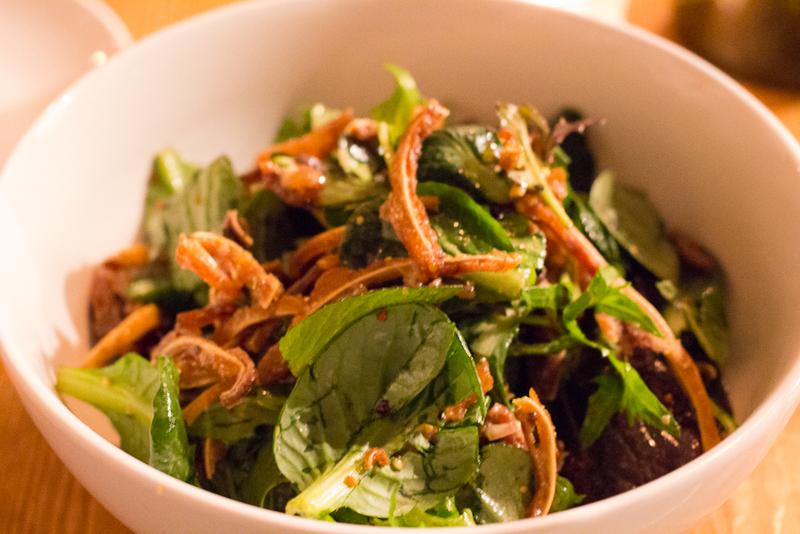 Curry leaves and pig ears are already hot in 2014. 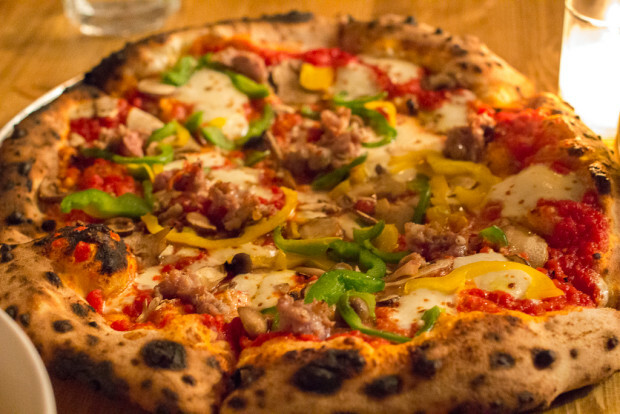 The service is as nice as can be, the neighborhood could use new restaurants and the pizzas have great potential–do not take my personal food aversions to be a condemnation. were still waiting for tables by the time we vacated). Buzz, they have it. solid and the newlyweds who run it seem earnest. It's just not a cool place. wine topped out at $45. bites that could be fun to nibble at the bar. roast chicken unless it's pollo a la brasa: it's really boring. make for a super-slammed opening weekend. This time of year in 2007 I was writing ten restaurant reviews a month for Latina, and it didn’t take long before I felt like crying tio if faced with one more plate of beans, yellow rice, plantains or yuca. The gig didn’t even last into the second half of the year, but I still burnt out on nearly everything Latino (Peruvian and Mexican, excepted). I wondered if I’d ever have a craving again. It took three years. Saturday night and all I could think about was Nuevo Latino fare. And being provincial like most Brooklynites, I didn’t feel like heading into Manhattan (it’s not as if the MTA has been making it easy lately) where Yerba Buena would make a fine choice. Brooklyn has Luz or Bogota Latin Bistro. Both are acceptable not remarkable. Sometimes average is good enough, though. I chose Luz because I have only been once when it was new (and because the last time I was at Bogota Latin Bistro, I threw up on the sidewalk out front, no fault of the food, maybe the fault of cahaça). Scaffolding nearly obscuring its entire façade, the busy restaurant is a bright spot in a barren patch of Clinton Hill. And it was hopping, only one table open and every bar stool occupied, primarily with date night couples. Based on casual observation, cocktails outnumber wine orders two to one. I had a Baron Rojo, the blackcurrant, rum, pisco, cranberry juice and aguardiente garnished with star anise was potent yet still sweeter than what I'd typically drink. Crab ceviche was light and limey and served traditionally with toasted corn kernels. The pork ribs were an odd choice to start with since I had beef ribs for my main. Once again, a bit sweet, and from a cranberry bbq sauce. Cranberries don't strike me as particularly Latino, but here they were again. I chose the short ribs because the description seemed so cold weather appropriate: rijoa chestnut jus, butternut squash and shrimp pastelon and pickled okra. The okra seemed like the oddball component but the rich, fatty meat and shrimp-filled pastry covered in melted cheese desperately needed something crispy and tart. Okra was smart. Luz isn't really a destination restaurant. It's not really even a travel from Carroll Gardens restaurant. But if it were in my neighborhood, I would pay a visit every now and then.